This is what blogging has done to me, y’all…as I was using my steam mop this morning I thought, “Oh, I so need to do a post on my love for this mop.” Let me say that the lovely people at Shark have no earthly idea who I am or that I’m posting this…I just wanted to share something that I love (much like these awesome candles). One of my favorite things in our house is the laminate flooring that covers almost all of our open spaces – the laundry room, kitchen, living room, entry way, and hallway. It’s a beautiful, wide-planked, dark reddish-brown floor that has a hand-scraped look. My husband actually chose this color and I conceded. I wanted a different color (I can’t even remember which one) but am SO glad that we went with his choice. The only downside to the floors? Cleaning them without showing streaks. Until I used this Shark Steam mop. It cleans them PERFECTLY and without streaks! 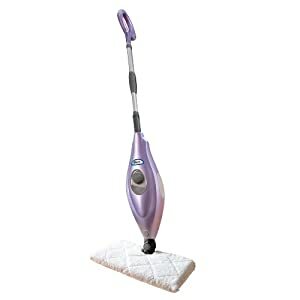 My mom bought me this steam mop for my birthday, when it was on super sale at Target during their Black Friday sale. I know I’m old when I start asking for cleaning products for my birthday. Ha! It normally runs about $79 which is definitely worth it, in my opinion. You don’t need any cleaners, just water, and the cleaning pads are washable. So much better than the disgusting heavy mop and bucket. Do you have any favorite cleaning products? Do you have Shark Steam mop? Love it or hate it? My mother got one recently and loves hers too. I have it on my want list. Keep an eye out for sales, Anna! I think my mop was on sale for $40 on Black Friday. Definitely worth it (in my book) when you consider you don't have to spend money on pricy (chemical-laden) cleaners or mops anymore!